So you have probably been spending hours and hours looking for the best brand to buy a sewing machine from. We appreciate it, as that shows that you’re serious about your sewing endeavors. 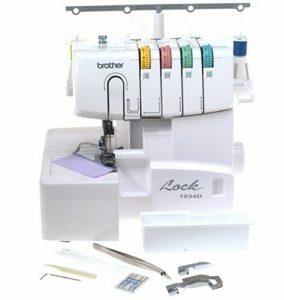 That said, you would be glad to know that your research has certainly paid off as Brother is one of the most reputed sewing machine brands out there. However, you must know that choosing the right brand is only half the job. The other, and the more important half of the job is to choose the right product. But guess what, unless you’re an expert at analyzing the features of a sewing machine, it would be wise to leave it to someone who is. And that’s where I come in. When it comes to reviewing sewing machines, I’m an absolute beast. 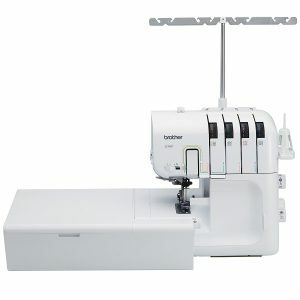 In other words, I can help you choose a sewing machine that would be just perfect for you; nothing more, nothing less. 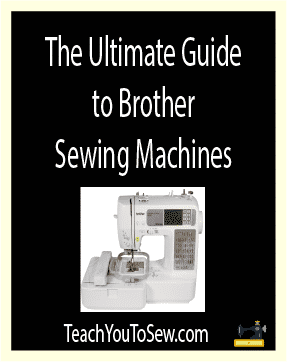 The Best Brother Sewing Machines. 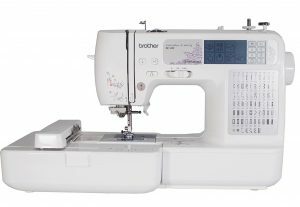 If you’re just entering the sewing world, don’t waste any time looking for other products and just go for the Brother SE400. There’s just no better sewing machine for a beginner than the SE400. It’s a computerized sewing machine that’s extremely user-friendly and has all the features a beginner may ever need. Be it threading or adjusting, it’s going to be an absolute breeze with the SE400. 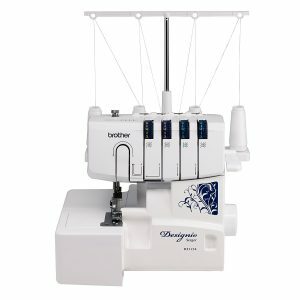 The variety of stitches it offers is going to leave you amazed as well, especially for a beginner-friendly affordable machine. However, don’t mistake the beginner-friendliness for lack of functionality. It actually comes with more features than you can expect at this price point, and offers an AMAZING value for money. The quality of its touch screen is surprisingly good, and this machine can make you patches and free standing laces as well. In fact, the quality of work this little beast produces is easily comparable to that of some of the high-end options on the market. The thread cutter might seem like a useless feature at first but you will find yourself using it every now and then as you realize how it enhances your overall sewing experience. The pressure feat boasts quite some variety as well, and that’s again something you will find very useful. If you want to make your transition from a beginner to an intermediate faster and smoother, the SE400 is pretty much what you’re looking for. Perhaps the only downside to this machine is that its 4×4 embroidery field can turn out to be on the smaller side for heavy duty embroidery projects. No need for a standalone embroidery machine! However, this isn’t something that should worry beginners, as they wouldn’t find themselves working on such projects anytime soon anyway. All said and done, the SE400 is a fairly affordable Brother sewing machine that has everything a beginner sewer can ask for. As we just mentioned, versatility is really a strong point of the Brother 1034D. It allows you to produce professional quality work using a variety of fabrics, which is certainly more than what you can expect in this price range. Similarly, unlike other beginner-friendly overlocker sewing machines, the 1034D is versatile enough to be used for different types of sewing projects, including creating attractive edges and ruffles, joining laces and many more. 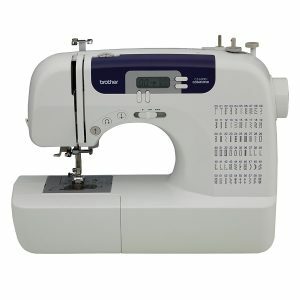 It boasts 22 built-in stitch functions with 4-thread and 3-thread overlock. There’s a huge variety of stitch functions so regardless of the kind of sewing task you’re looking to work on, this all-in-one serger would have you covered. While what it does is impressive, what’s even more impressive is that it does it at a great speed and efficiency, and would definitely save you tens of hours of work over time. Also, its versatility is not just limited to its features and sewing abilities, but it allows you to remove its arm to perform some of the otherwise more complex sewing tasks like sewing cuffs with great ease. You can also adjust it the way you want to allow for a perfect sewing experience according to the type of fabric and stitch width you may be working with. There’s also this unique feature that lets you tuck the blade out of the way when needed, which is something hard to come by in a serger at this price point. Finally, there’s just one thing you need to keep in mind BEFORE you start using the 1034D serger. You need to oil it before you put it to use. Here’s how to oil a sewing machine. This is something you may not get to know from the manual but not oiling it before using it for the first time can lead to durability issues over time. Apart from that, there’s nothing that should stop you from going for the Brother 1034D Serger, especially if you’re on a budget and looking for something that’s not too advanced. Many sewers don’t think they need to upgrade their (beginner-friendly) machine even when they get well-versed with the important basics of sewing. This isn’t an ideal approach to your sewing, as in order to keep improving as a sewer you need to make some upgrades from time to time. With that said, the Brother DZ1234 is likely the best bet for anyone that can now proudly claim that they are more than a beginner sewer. It comes with three different types of foot so that you are introduced to different ways of approaching your sewing projects. In fact, it comes with pretty much everything you can need when working on something that involves creating unique, high-end finishes. Oh, and did I tell you about how it compares to a sports car? Well, with a stitching speed of up to 1300 stitches per minute, the Brother DZ1234 seems to offer the fastest way to create highly fashionable pieces of clothing. However, you get that kind of crazy speed WITHOUT compromising on the stitch quality one bit. The DZ1234’s differential fabric feed achieves a 0.7 – 2.0 ratio on most of the common fabrics, including the lightweight ones. This translates to consistent, durable stitches for almost all types of projects, no matter the type of fabric being used for the project. The DZ1234 is also surprisingly versatile when it comes to the stitch width, with a range as wide as 3.0 mm to 7.0 mm. Now, you may have used or are familiar with some other sergers offering the kind of performance and power that the DZ1234 does. But, believe me, most of them wouldn’t even come close to being as quiet and smooth as the DZ1234 is. If you’re looking to work on some heavy duty projects, it can really make a lot of difference. For those of you cost-conscious folks out there, you would be glad to know that the DZ1234 has no problem accepting standard sewing machine needles. This means that you can use your old ones or use them interchangeably with your other machine. That’s quite a bit of savings for you right there. Talking about cost-effectiveness, I’m sure I’ve some value hunters frequenting my blog. First things first, there’s a reason the CS6000i has amassed well over 7000 reviews, with the vast majority of them being ultra positive. If you’re on a tiny budget and want to get the most bang out of your bucks, the CS6000i is one of the very few – if not the only – option you have. The LCD screen is fairly functional and the machine itself is impressively versatile. There are easy start/stop buttons for controlling the foot, and there’s also have a variable speed option that the beginners will love. The CS6000i is actually absolutely beginner-friendly, what with its idiot-proof threading, bobbin winding and adjustable speed. It’s so versatile and easy to use that you would really be hard-pressed to have any kind of trouble using it. However, that requires you to carefully go through the user manual, as you’re likely to encounter some errors if you don’t do so. All in all, if you’re looking for a feature-loaded sewing machine on a very tight budget, you just can’t go wrong with the CS6000i. Now that we have reviewed a few affordable and beginner-friendly options, it’s about time we get to some of the more high-end ones. If you’re after a sewing machine for overlocking, the Brother 3234DT should hit the spot just right for you. With its 2, 3 and 4 thread options, the 3234DT is one of the more versatile overclocking machines on the market. Do you want to work on something that demands a professional edge finish? The 3234DT would definitely be up to the task. Do you find yourself working with a variety of fabrics? You will be glad to know that the 3234DT can handle them all. The long sewing table it comes with paves the way for some serious heavy duty sewing, so the 3234DT is certainly not made for those hobby projects. The design is incredibly practical, with the 3234DT managing to offer even the features some of the other sergers, including the more pricey ones, fail to offer. I think that in terms of the features, it’s easily comparable to the Bernina serger, and that’s saying something given that the latter costs way more. As mentioned above, this is no cheap hobby sewing machine. It was designed with professional use in mind, and oh boy has it turned out to be a beast at that. There’s the enormous amount of storage so that you have a clear working area without any clutter. Making the table extendable was nothing short of genius, as it helps get around so many typical issues that are annoyingly common with other sergers. Then there’s the narrow cuff that allows you to do cuffs and legs; if you have used sergers in the past that didn’t offer this luxury you know what it means. When it comes to the ease of threading, even someone like me has to wonder whether there’s anything like the 3234DT. It’s super easy and extremely quick, something pretty rare when it comes to sergers. There’s actually also the automatic threader that can take all the challenge out of the otherwise very tedious task, without you having to lift a finger. Talk about sewing convenience! Finally, the 3234DT leaves absolutely nothing to be desired on the overall performance front as well. It’s my FAVORITE on this list and I highly recommended it if the price isn’t much of an issue for you. Now, when I said people with different sewing needs, I primarily meant those that are looking for a cover stitch machine. 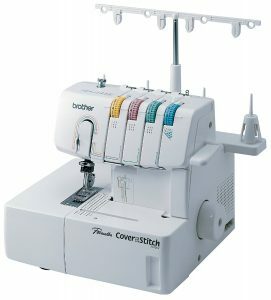 It’s important to note that the Brother 2340CV isn’t exactly a serger, but a cover stitch machine. You need it if you’re into advanced sewing and work on projects that require making cover stitches, as well as hemming and finishing. With that out of the way, let me tell you that you will thank yourself for getting the 2340CV if making cover stitches is one of the regular sewing tasks you work on. Sure, you can also use a high-end serger to do that, but it’s going to be way more complicated and time-consuming. Using something like the 2340CV, on the other hand, is going to be surprisingly convenient; not to mention you will end up with cover stitches that are way nicer. It comes with an impressively long list of features for something that’s only designed to perform some specific sewing tasks, primarily making cover stitches. Some of them include color-coded threading, looper threading, being easily able to adjust the stitch lengths using adjustment dials, a differential feed, a pressure foot dial and many more. However, it’s great at what it’s intended to be – a cover stitch machine. It’s capable of making many different types of cover stitches, as well as working on a variety of fabrics, irrespective of their thickness. Needless to say, it’s perfect for both decorative and constructive sewing tasks. Something to keep in mind while deciding to go for the 2340CV is that it has a bit of a learning curve. However, you wouldn’t have much of a problem getting used to it fairly quickly if you follow the instructions to the T.
The 2340CV is the only cover stitch machine on this list, but, given the quality of cover stitches it produces, it’s probably more than enough.